On August 8 1971, the United States was still playing a massive role in the Vietnam War, Richard Nixon was president and the infamous Watergate scandal had yet to occur. 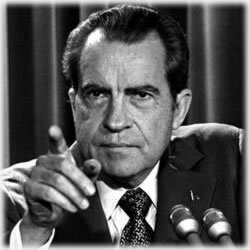 The economic front was doing rather poorly and the Nixon Administration put into place a number of economic measures. Among them was a unilateral move to end the Bretton Woods system. The Bretton Woods exchange was formed during World War II in anticipation of rebuilding the global economic system. It defined international procedures and rules each participating country would abide by, as the war exposed not only vulnerabilities but also put into place the necessary checks and balances of a world following a major war. The name of this new system was the International Monetary Fund – or as we know today, the World Bank Group. So why are we writing about the past economic problems? The answer’s easy: in order to understand the nation’s current economic problems, the first best place to look is the past. And you might be surprised at some of the common denominators during this time and our modern financial sector. With a 4.7% inflation rate in 1971 – which was deemed extraordinarily high – was overwhelming and frankly, scary for many Americans. These are the same Americans who’d sent their loved ones off to a war that no one fully understood – to say the nation was nervous is an understatement as images of battle showed up on a daily basis in the 6 o’clock news. There was one major divergence from those days in 1971 and our reality today: unemployment as extremely low in the early 1970s; however, interest rates on credit cards, mortgages and automobiles were quite high. Of course, it’s the opposite of today’s scenarios as we’re still seeing unemployment numbers near 8% and incredibly low interest rates are dominating the lending sector. Nixon had his work cut out for him. Many thought once the war was over, things would even out – much the way the mindset is today of those looking to Obama for solutions. Here are a few more similar goals, efforts and even failures that mirror today’s national money problems. Give us six months, and if we haven’t ended the war by then, you can come back and tear down the White House fence. I’m running because after a decade of war, it’s time to do some nation-building here at home. Both made campaign promises based on the same fear of not having the support of voters based on a war. Meanwhile, the Nixon Administration proposed a plan for hat was being referred to as “universal federally run health insurance, partly motivated by dramatic rises in public and private health care expenditures”. He then raised the bar and decided a health care plan which would provide insurance for low-income families, while requiring all American employees be provided with health care. This meant that forty million people would go with no health care policies. The measure failed as Dems were vehemently opposed to it and they were the majority in Congress. Of course we’re all familiar with the current controversy behind Obamacare. The irony is that there are approximately 40 million uninsured Americans right this minute – which, according to Nixon critics, was exactly how many would be left out of Nixon’s ideals for healthcare in 1971. Nixon’s “New Federalism” meant knocking some of the power out of the hands of the federal government and instead moved that power to the state level with the goal of empowering those states. Obama’s program included giving states the decision making process of who receives waivers regarding welfare and job placement assistance. He had the support of the Department of Health and Human Services, too. One spokesperson said earlier this year that these waivers would allow for successful training and long term employment opportunities. Nixon put into place the Clean Air Act of 1970. Obama put into place the Credit Card Accountability Responsibility and Disclosure Act of 2009 – or as we often refer to it the “CARD Act of 2009”.